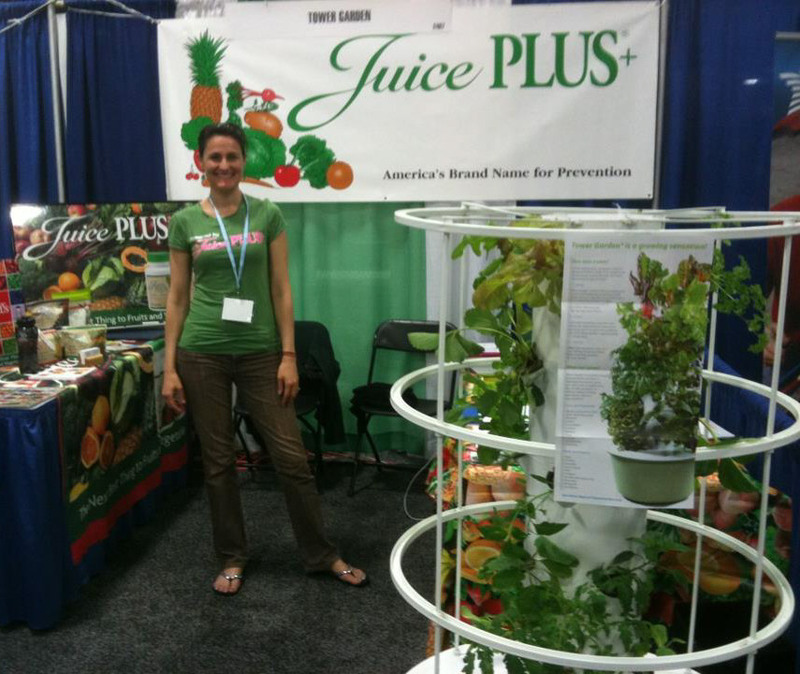 Elizabeth Tasis found this business at a trade show many years ago. She now has a 7 figure income with Juice Plus+. At a recent show her team got 31 customers, 4 distributors and 1 doctor. You will have less than 2 minutes to make an impression, so smile and ask great questions. 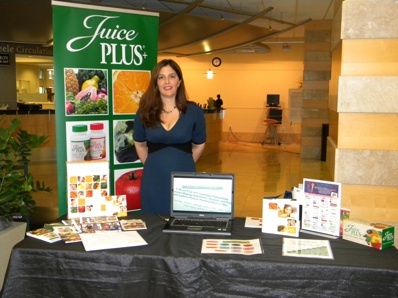 Your goal is not to sell Juice Plus+ (really! ), and you are not there to give a brochure to everyone who passes by. Your goal is to have meaningful conversations and to capture their contact information for later follow-up. Have a registration sheet on clip boards. This is the most important thing you have on the table. Be sure to check that the name, phone # and email are legible. Offer a free product drawing as an incentive. After the conversation, take notes about the person and what you gave them: DVD, brochure, sample, etc. Offer JP+ Chew samples to each of your “meaningful conversation” people (not everyone). Colorful fruit and veggie tablecloth. The more colorful your booth, the better. You want it to attract attention, so others will come over to see what you are up to. Table Cloth  Fruit and vegetable table cloth. The more colorful you can make the booth the better. A basket of fresh, raw fruits and vegetables. This is optional. Go ahead and buy all of the ones that you can find that are in Juice Plus+. Weigh them before you leave the store and get the total cost of them. That way you can say, Here are the fruits and vegetables that I found in JP+ at the store yesterday. The others are out of season, but we are still getting them raw every day in JP+. Also, the f/v in this basket weighed 12 pounds and cost me $15. That’s about a 2-day supply of JP+ and its only $1.40 a day. Also, these are vine ripened, unlike the ones that I bought at the store. They have to pick them so early to be able to get them to the stores before they ripen. Put this in your own words, but you get the idea. Its a great visual comparison. Have the capsules in the orange capsule holder next to the basket. Show the simplicity of taking them vs. eating all of those fruits and vegetables. Plus, I always tell people about the variety. There is no way that I would eat 17 different f/v every day. I dont like all of them plus I would be chewing all day long! I tell them that I eat my favorites, like most people do or I cook them so most of the nutrition is destroyed. I make it a point to say, We are not saying don’t eat fruits and vegetables. Keep eating as many as you can. JP+ is a great way to add more to your diet and a variety each day. We all know the importance of eating a lot of them. Its just hard to do on a consistent basis. Bring a spray water bottle to keep your fruits and veggies looking good and fresh. On-The-Go books (large) – have several that you can use to show people along with the Conclusion board on the research. A good one to have on hand to show (not necessarily on the table) is the apple board. Thats great when someone says, I take a multi-vitamin. You can say, These are 400 of the 10,000 vitamins that are found in an apple. In JP+, you are getting tens of thousands of vitamins every single day. It is a whole-food supplement. This is another great visual. 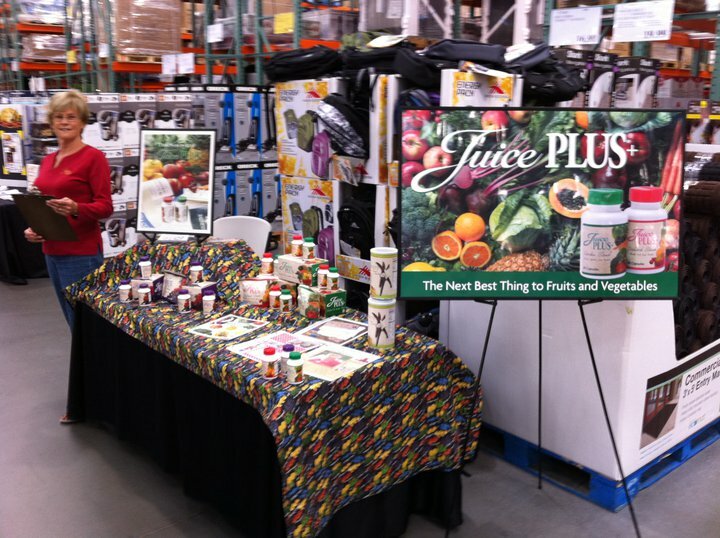 Juice Plus+ Banner. You can order one from Promo Plus for or borrow it from someone. This is great to have if you have an area where you can display it elevated behind you or to the side of your table. Handouts. Here’s a useful handout. Its much cheaper than using brochures and you do not need to use your business cards either. Be sure to include your name, phone number, e-mail, your website address. Point these out when you give them the sheet so they can get additional information. I like to use 24-pound paper. Brochures work well too, but be sure to put your contact info. label on each one. Orange JP+ capsule holders filled with capsules8 of each per container. Give them to those who decide to become a preferred customer that day. Tell them to take 1 of each daily until their order comes in. Study, for adults who cant swallow or children who dont like soft chews. Fruit and veggie balloons. These are really cute and another attention getter. Most grocery stores can order them for you. They have faces and personality. Even colorful solid balloons would work if you cant find the ones Im talking about. Fruit and veggie beanies. These are not a necessity. Just another way to add personality to your table. Empty capsule and soft chew boxes. Also, empty capsule bottles and soft chew jars. Use them for stacking and making a nice display. Have a few capsules so people can see what they look like. Sign advertising your incentive like FREE first week of Juice Plus+ in a travel container when you become a Preferred Customer today. Ive given away the JP+ water bottles along with the first week as well. This is up to you. Try to get as many as possible to become a customer right on the spot. The more you can get to do this, the better! Have a few DVDs and brochures and distributor info (application, VF brochure) under the table to give on an as needed basis. Give DVDs and/or brochures to those who become a customer or who are very interested in JP+. Be sure to get their information so you can call them back (sign-insheet). Preferred Customer Order Forms on clipboards. Penshave plenty. You can order Juice Plus+ ones through Promo Plus+ if you want. JP+ Chewable Samples with business card stapled to them. Everything must have name, phone# and email/web address. . People believe what they read not just what they hear. File Folder to organize your leads. Don’t sit, stand and move out in front of your booth or table to greet people. Answer questions briefly, then ask a question to get them talking – don’t talk too much! Smile, be friendly and outgoing. Be someone that others want to meet. Stand up by your booth, and move out into the aisle when there’s no-one at your booth. Do not sit down when there are people passing by. Have 2 chairs, though, so you can sit down with your new preferred customer while you fill out the paperwork. Build trust and rapport. Be someone that others want to refer their friends and family to. Have fun, use humor (if you have it!) – laugh together, it breaks the ice quickly. Some people give a DVD to everyone who registers for a Free DVD. Then follow up on those. This is up to you as well. I’ve tried it both ways and still am not sure of my decision on this. We don’t! The key to a successful show is FOLLOW UP. Be sure to have a sign-in sheet on a clipboard or on the table for them to fill out [simply ask them: “please sign in” – and they do! ], so you have a way of contacting them after the show. 2 or 3 clipboards would be good. Write next to their information what you gave them and anything that you talked about. This will make it much easier when you call to follow up with them. .schedule on your calendar before the show, the day or days that you will follow up with your leads from the show. Without taking the time to follow up, then you have basically wasted your time and money for doing the show (I am speaking from personal experience herebelieve me). Have 2 people at your booth. Makes it more fun and is nice if you need to leave the booth for a minute. Its also good to have one person to go the other booths to network with them. Do not play a DVD. Its too distracting. Wear a name tag. Make one if one is not provided. Attitude: bring a good one! Go into it with a goal of how many preferred customers you want to sign up that day. Remember that you have something that everyone needs. Dont worry about the ones who dont realize it or see the benefit of it. There are plenty of people who ARE interested. Remember that the company gets 15,000 new preferred customers every single month. Remember why you are taking it. Share from your heart. Have FUN with it!! Know before it even starts that something good is going to happen!! See it, believe it and be positive!! Network with the people at the other booths, they are often your best prospects. Here are great tips from experts. Make them work for you. If we were standing here together 3 years from now what would have to have happen in your health picture for you to be happy with your progress? What are the obstacles to that progress happening? What opportunities and strengths do you have to make that happen? If you get them talking and get their barriers down, then you can find out how Juice Plus+ fits into what they want their life to look like in three years and you can tag on to that. You need to be a question master. Ask some questions back. They are going to tell you their needs and what their wants are and it gets them more interested talking. What do you say when someone asks, “What is Juice Plus and what can it do for me?” The first thing I always do is I ask them a question. 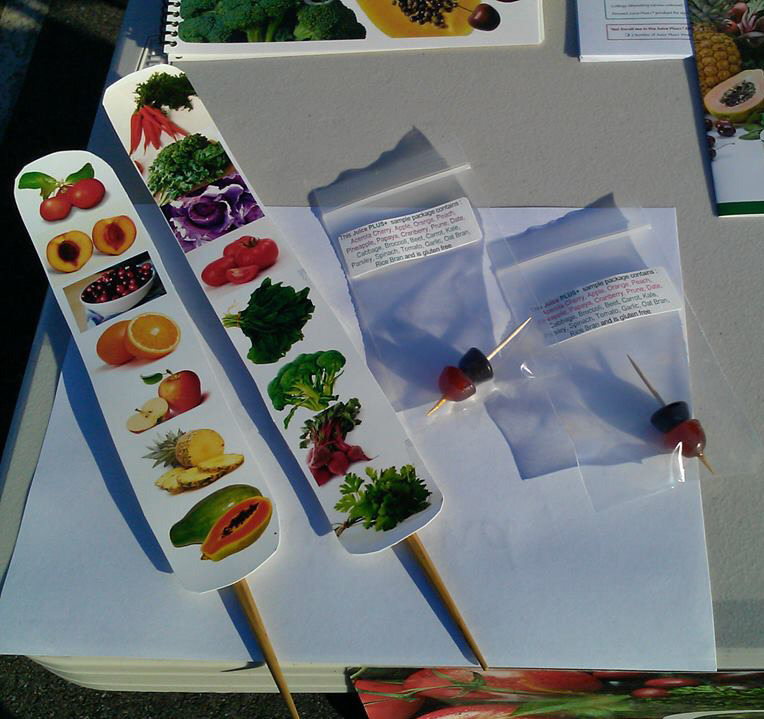 Do you understand the importance of fruits and vegetables and what they can do to impact your health? (Then you will know right away if the person is some what educated and even interested) Then I will say do you understand that they can actually help prevent disease? And if they say YES… Then I will say let me tell you what JUICE PLUS+ is. Juice Plus is basic nutrition. Its 17 raw fruits, vegetables and grains that have been put into capsule form. How much easier can it get? All of us are looking for a solution because we know we dont eat right and Juice PLUS+ is that solution. Would you like some more information? Start off with this and if they understand the importance, then I think that they are open to a discussion. The elevator statement which is basically “How do you deliver the message as to what Juice Plus is in the amount of time it takes to ride an elevator up or down. And by the way I do agree thats a critical thing to be able to do especially at a health fair is to capture somebodys interest and to qualify them to determine whether or not its a value for you to go ahead and talk with them. First of all what I would say is just something as simple as if someone would ask me what is Juice Plus? I just say well I have found that this an easy way to insure that I get it everyday, but if that is something that isn’t of interest to you thats fine and MOVE ON because if they start to deliver the objection right up front you don’t have time to talk to them. If you have longer to talk with someone, you can approach it differently. The Fortune is in the Follow-up! Below are emails you can send. Be sure to call as well as email.